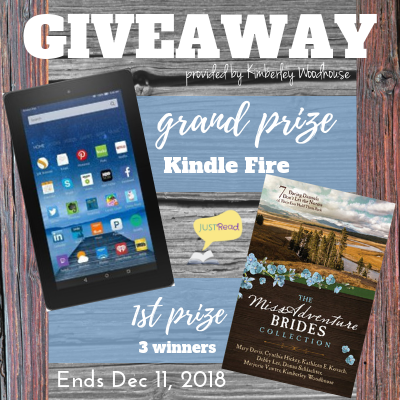 Welcome to the Blog Tour & Giveaway for MissTaken Identity by Kimberley Woodhouse, a novella included in The MissAdventure Brides Collection, hosted by JustRead Publicity Tours! Seven daring damsels don’t let the norms of their eras hold them back. Along the way these women attract the attention of men who admire their bravery and determination, but will they let love grow out of the adventures? Headstrong, bubbly, accident-prone Abigail Monroe is on a quest for adventure away from society’s expectations. But her pursuits are unexpectedly thwarted when she is arrested by a handsome Texas Ranger. Abigail Monroe raised her eyebrows at her maid. At twenty-four years old, she was used to hearing that her servants called her crazy behind her back—because, let’s face it, in the past she’d done some crazy things—but she was older now, and none of them had been bold enough to say it to her face since her parents’ passing. “It is not crazy. It is simply. . .eccentric.” She held up a pair of brown leather chaps and eyed them for size. 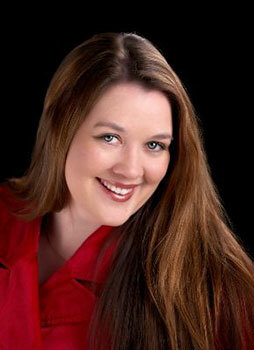 Kimberley Woodhouse is an award-winning and bestselling author of more than fifteen fiction and nonfiction books. A popular speaker and teacher, she’s shared her theme of “Joy Through Trials” with more than half a million people across the country at more than 2,000 events. Kim and her incredible husband of twenty-five-plus years have two adult children. She’s passionate about music and Bible study and loves the gift of story. That’s a total of FOUR winners! Enter via the Rafflecopter giveaway below. Giveaway will begin at midnight December 4, 2018 and last through 11:59pm December 11, 2018. US only. Winners will be notified within a week of close of the giveaway and given 48 hours to respond or a new winner will be chosen. This is going on my ‘To Be Read’ list! Yay! Glad I could share a book to add to your TBR! I know mine is always growing! You definitely won’t regret reading it! I am really looking forward to reading this, sounds so fun. I haven’t finished all of the short stories yet, but it’s a really great collection! These Barbour Romance collections are wonderful! I completely agree! So wonderful and great to read! Sounds good can’t wait to read this. 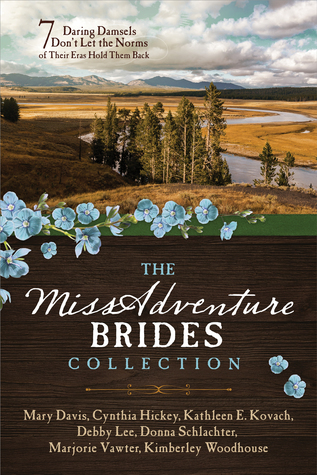 Enjoyed reading the excerpt from “MissTaken Identity” by Kimberley Woodhouse from the “The MissAdventure Brides Collection. I would love to be able to read the whole story as well as the rest of the book. You’re welcome! I love being able to be a part of book tours to talk about more books with people! And I hope you’re able to read the collection and enjoy it as much as I have! Love this cover the book sounds good. I love the cover too, and even though I haven’t finished all of the short stories, I’ve really loved reading this book! A beautiful cover! I would love to win this book. Best of luck! It is such a pretty cover! This sounds like so much fun. I tried to dress and act like a teenage boy once. LOL that was a joke. Everyone, even those who didn’t know me, knew I was a girl. Would love to read this group of stories. I love this cover. Haha, that sounds like a fun time! I really want to read this. Sounds like a great read. I hope you do read it, it’s a good one! I love the Barbour novella collections and this one sounds good! Thank you for participating in the blog tour and sharing the book excerpt. This one is great! And you’re welcome! I’m glad I was able to participate and share this book with more people!